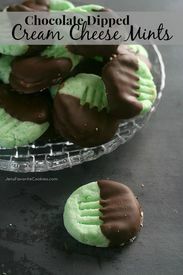 Cream Cheese Mints also known as Wedding Mints-easy to make, perfect to serve for any event. There are some memories you have from childhood that stick with you. These Cream Cheese Mints, also know as Wedding Mints, are one of them. Always served at special occasions, Easter, Weddings, Anniversaries. As a kid, I never thought about how they were made or what was in them, I just remember feeling special getting to have them. You want to know why I made these? Because it is Wednesday!